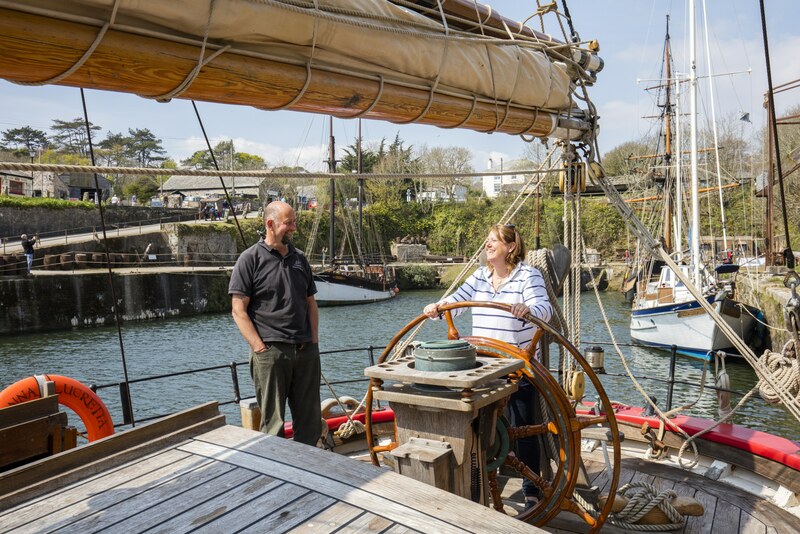 Our three-day Cornish taster weekend on the Johanna Lucretia begins as we watch the stately two-masted topsail schooner moor up on the quay at Fowey on Friday afternoon. We’re greeted on board by Captain Roger Barton and meet the crew, James, Josh and Radic, who brings the guests a mug of tea and a big slice of coffee cake each as we introduce ourselves. We’re shown to our double cabin – the definition of cosy but comfortable. The clouds part, the sun appears, and we edge away from the quay as the bow swings out into the channel. There’s a breath of a breeze – ‘a bit of north’, in Roger’s words. With much winding of winches and pulling on ropes, sails are raised and we’re gliding silently, serenely southwards, leaving the town behind. There’s a surprising amount of room on deck to walk about and relax as the crew go about their tasks. It’s so peaceful. The only sound is gentle conversation and the even gentler wash of waves against the sides of the boat. The plan is to head as far west up the Cornish coast as we can, before coming back east with the westerly tomorrow. We won’t make it past The Lizard, though, says Roger; the tide will be against us. Roger is only the boat’s third owner. He regularly competes in tall ship races around Europe, and has even won a couple of events. In open sea, we stay close to the coast – a coast of coves, green hills and harbour villages. We take it in turns to take the ship’s wheel, which is quite a feeling. A pod of dolphins joins us, darting back and forth across the bow of the boat, playing games with the would-be photographers among us. Dinner is served downstairs by Radic – a fine, warming mushroom risotto. Sure enough, we don’t make it round The Lizard; we drop anchor at Coverack just after sunset, and head to bed soon after. All of this watching the crew work hard has taken it out of us. Next morning, we take the dinghy ashore and have an hour to take in the unspoilt charms of little Coverack, unaware that 48 hours later flash floods would wash homes away and make the village a national news story. Back on board, we head a little further south down The Lizard’s east coast, and tack into Cadgwith Cove, catching a glimpse of The Devil’s Frying Pan, a spectacular natural rock arch that angrily spits out seawater in heavy seas. We moor up on a jetty with a dozen or so smaller boats, and enjoy top quality pork sausages and creamy potato mash on deck as evening draws in. On Sunday morning, there’s time for a stroll around the rolling grounds of the National Trust’s Trelissick House before the final leg back to Fowey and some fond farewells. It’s been a wonderful weekend of reflection, relaxation and gentle education in the ways of traditional tall ships.